CIPA Member Bernie Nagy has been an entrepreneur, graphic artist, art director and a professional photographer for over 50 years. After retiring, he moved to South Park, Colorado and fell in love with its wealth of history, unparalleled scenery, fertile grasslands, lush hills and towering mountain peaks. In 2010 this part of Colorado’s high country was designated as one of only forty National Heritage areas in the United States. Bernie vowed to create a pictorial essay to bring to an audience of nature lovers and heritage tourists credible information and a different view of South Park from that presented by the well-known TV-Series that shares the same name. His first coffee table book, Colorado’s South Park, High Country Paradise, was so well received that within the same year of publication, a second slightly revised edition was printed. The book received several awards in 2010 including winner of the prestigious 2010 Colorado Independent publishers Association- EVVY Award for “Best Travel Book” and winner of 2010 CIPA TECH Award for “Best Cover Design”, “Best Illustrations”. Later in the year at the New York Book Fair, the book won again as the best International Regional Travel Essay Book. 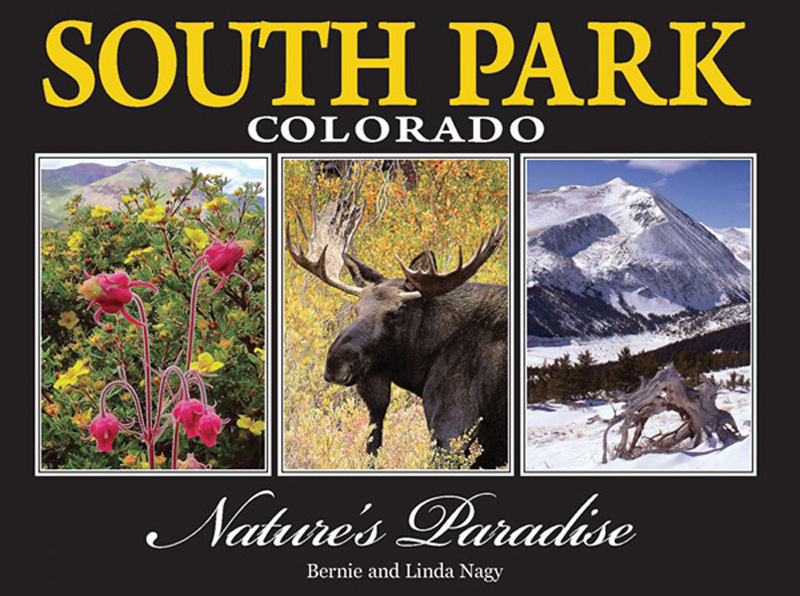 Because of the success of his first photo book, Bernie and his wife, Linda, co-authored the second book in a series, called South Park, Colorado, Nature’s Paradise. It captures the amazing dramatic seasons of the year, the bountiful wildlife, the flora, and the scenic wonders of the region. Over 100 wildflowers are photographed and identified in the book, some of which are unique to the area. As you journey through these books, you will want to stake a claim in this vast and remarkable land and discover for yourself why many consider South Park, Colorado, a true High Country and Nature’s Paradise. Bernie Nagy has captured with the spirit of the area with his superb colorful images. He and his Co-Author wife Linda have created pictorial odyssey that admirably captures all four Season in the South Park area. You have captured the heart and soul of such unique part of our state. The real South Park has been well served. –Jeff Lee, Director Rocky Mountain Land Library, Colorado. I want to thank you for the endeavors to preserve Colorado’s natural heritage. Your photographs capture the beauty of South Park and of our state. I am looking forward to enjoying this book for years to come. –Mark E. Udall, U.S. Senator, Washington, D.C.